Ideas for helping older adults mentally and physically make the move from home to assisted living. There are few changes in an older adult’s life as frightening and impactful as moving from home to a senior living situation. All of the old, familiar habits are suddenly obsolete, and waking up in a strange bedroom can be an alarming experience. Neighbors and friends are no longer nearby, and routines change abruptly. How can family and caregivers make this difficult transition easier and smoother? A referral specialist, also known as a referral professional, can take much of the burden off the shoulders of family members navigating uncharted waters. This professional can often assist in evaluating the older adult’s need for services, including their safety at home, and give the family or caregiver options for addressing those needs. A referral specialist should be able to point you to senior caregiving services that have a good reputation and solid licensure record with minimal care violations or citations, something that might be covered up by a lovely building and vivacious salesperson. The referral professional can evaluate your budget and give you options in your community that you can afford, whether for part-time help at home or for a move into assisted living, an adult family home, or a memory care community. The specialist is trained to anticipate future needs as well, and can discuss continuance of care for the duration of your life. 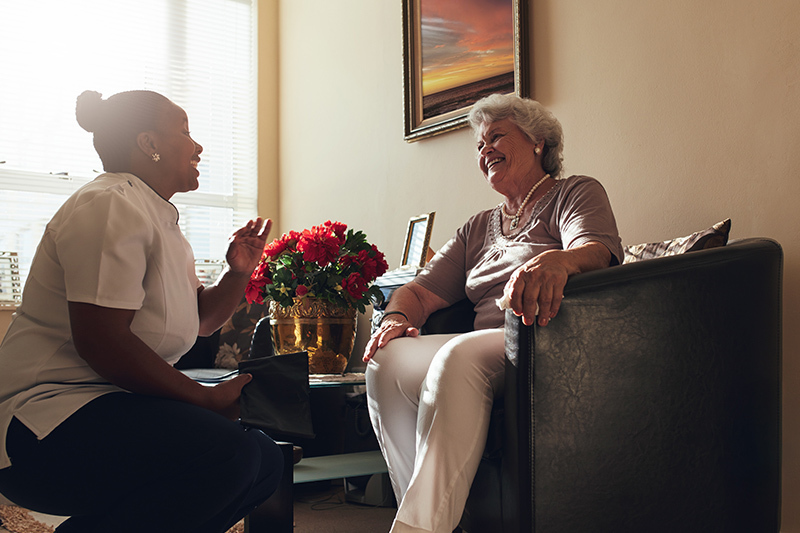 Additionally, a referral professional can point you to competent service people in the community who understand the needs of older adults and their family. You may require the services of a realtor, an elder law attorney (for a power of attorney or advanced directives), or even someone to manage downsizing or moving. The referral company, often known as a placement agency, should employ personnel who hold accredited credentials, such as the Certified Senior Advisor (CSA)® designation, to ensure they act in a capable and ethical manner. Ask if they have additional certifications with a state or local organization. How long have they been in business? Check online reviews, or ask for references. Once the decision has been made to move out of the home, a lot of work has to be done. It won’t be easy. Fifty years of accumulations may require sorting and winnowing, sometimes quickly if Mom or Dad is moving out of state to be near a family member. Decisions about what to keep, what to give away, what to sell and what to take to the dump, can be wrenching. Are you eating well, or do you subsist on simple foods like soda crackers and chips? Are you tripping or falling and covering up the bruises when visitors come over? Are you able to bathe regularly, do the laundry and dress in clean clothes every day? Can you take care of the yard and house by yourself? Are you able to take your medications as prescribed, in the right dose? Can you operate all of the appliances safely, remembering to turn off the oven and stove? Does your home have grab bars and emergency response systems if needed? Is there a plan in place in case of an emergency? Is your driving up to snuff? Do you have an alternate way to get around? Are you paying your bills on time? Are friends still coming over, or have they largely left the neighborhood or passed away, making home seem more like solitary confinement than the happy place it once was? It may be time to seek out some help for an hour a day, or a day a week. But if you or your loved one is in danger of hurting yourself or others, a move may be in order. Keep precious objects for their new home. Consult with the older adult about which furniture will fit in their new space, and what will be comfortable. Take cherished jewelry or memorabilia that will is filled with memories. Familiar artwork, kitchen tools and clothing all ease the move. For families, this is usually not the time to decorate in your own style, replace Mom’s outdated clothing or lay claim to her jewelry. Expect your loved one to make negative comments. These may be about the decision to move, the way you pack, the new place or you. Take a deep breath and just listen. It could be that Mom or Dad simply needs to vent, or they may be trying to maintain decision-making power over some small thing when they feel they’ve lost it in bigger ways. Use this as an opportunity to make the situation better, if possible. Allow yourself some bad days. Usually, transitions are smoother when you know what to expect and how to make your loved one feel more at home. We’ve compiled a list of tips and suggestions for making the move go smoothly. As a caregiver or family member, you can make a great deal of difference in how comfortable and personal your loved one’s new home is. Most facilities allow several visits before your loved one actually moves. Enjoy some meals together, and get to know some of the staff by name. Find the dining room, library, or game room. Show your parent the outdoor walking path, beauty salon, movie theater and anywhere else they may need to go. Many senior communities maintain an active online presence where you’ll find photos of residents enjoying daily activities. Bring things your parent has made or collected to put in their room. Keep the feel of their old home using photographs, color scheme, furniture and paintings. Family photos and crafts are particularly welcome. Stimulate the senses with scented candles, soft fabrics and the use of color. Seasonal reminders such as colorful leaves or a timely bouquet can make the room cheerful. Decorate for the holidays, preferably with the person’s own ornaments. Magazines, books or audio books, music and newspapers can be welcome additions. Expect your loved one to be tired and even short-tempered on moving day. Transition days are physically and emotionally taxing for everyone. Ask your loved one where they’d like furniture and artwork. Look for ways to say “yes” to requests such as putting artwork in odd places. This is their home, not yours. Take time to sit and talk about a move they remember, an outing you two have planned or what’s on the menu for dinner. Walk your loved one from their room to the dining area, noting how to find the way back. Discuss the routine, including when meals are served. Write it down if necessary. It’s a good time to rally friends and family, especially if Mom or Dad has moved from out-of-state to be near you. Put some subtle pressure on siblings to get on a calling or visiting schedule, and let everyone know Grandma would welcome cards, letters, texts, emails, phone calls … whatever your loved one has access to. Encourage faraway friends to initiate contact as well. You might wonder if you’re visiting too much. Call and visit as often as you want to. Especially while your loved one hasn’t yet made friends or developed a routine, it can be soothing to you both. Set up a comforting routine, or call your loved one ahead of time to let her know you’re coming. Avoid meal times, nap time, and therapy or other treatment time. Check with staff if your loved one isn’t sure about the schedule, and let other visitors know what works too. Knock on the door before entering your loved one’s room. Think about what activities your parent enjoys. Are there favorite movies, games or music? Would your loved one enjoy telling you family stories while you take a video or write them down? Elicit stories by asking about past events or milestones. Take advantage of opportunities to keep your loved one involved with your family. Sharing photos, FaceTime, Skype or home videos can spark memories and make new ones. Record events such as graduation ceremonies, sports games and school plays and concerts, then share the footage. Your loved one may enjoy a manicure or pedicure, or help writing a letter. Bring a board game, deck of cards, puzzle or bakery treat. Take a leisurely stroll. Don’t be afraid to bring children. Youngsters rarely react negatively, and teens can be an asset if they understand the assisted living environment. But do remove tired children or unwilling teens. If you have young children, bring simple games like tic-tac-toe or dominoes, or some coloring materials. Ask your parent about games they played in their childhood. Bring a small gift for the child to open or present. Start new family traditions with a shared treat or holiday celebration. Have children create a living history by asking about firsthand experiences. In some ways, this time will go by in a blur, and in other ways, it may drag. You may second-guess your decision many times, and other days you’ll feel confident you did the right thing. Evaluate the number, length and quality of your visits. Does your loved one have a steady flow of visitors that still allows time for them to become involved in the community? Are you happy about how your role has changed? Outings can give you and your loved one a chance to connect. Get an ice cream cone, go out to a show, take a walk in a park or find an event at your local library. Your parent may enjoy going to happy hour, visiting a microbrewery, attending a religious service or taking a short shopping trip. Bring your loved one home and cook dinner, or show them the garden. If negative comments continue, remember to pay attention to your loved one’s opinions. Treat them as an equal in the conversation. They may be using negative comments to voice uncertainty or fear. If you are concerned there is a problem with the staff or facility, make an appointment to speak with an approachable staff member or the administration. Follow the facility’s complaint procedure. Dissatisfaction may be expressed as depression, anxiety, hostility, withdrawal or unresponsiveness. If you’re not satisfied with the response, each state has an ombudsman program to help family members resolve complaints. Many assisted living facilities report that it can take between one and three months for a new resident to become comfortable. Don’t expect immediate results, especially if your loved one is getting over the death of a spouse or adjusting to a health issue. However, time and love are the key ingredients for helping anyone adjust to life in a senior care facility. “Signs That Tell You It's Time for Assisted Living,” AgingCare.com. “Helping Elderly Parents Transition to Assisted Living,” AgingCare.com. “Transition to Care,” American Health Care Association. “Making The Transition to Senior Living: One Family’s Story,” A Place for Mom, Inc.
“5 Ways to Help Your Loved One Transition to Senior Living,” Christian Care Communities. “11/10/2017 Interview with Steve Steve Garrett, CSA on Transitioning to a Senior Care Facility,” CarePatrol Pacific Northwest.